Designed to be more than OE replacements, Moog's coil springs come with a variety of shapes and ends. This selection, combined with Moog's lifetime warranty handled right here at DST, lends security to whichever choice you might make. While they are certainly higher quality than the OE springs, each of Moog's coil springs were designed to still have the same spring rate. 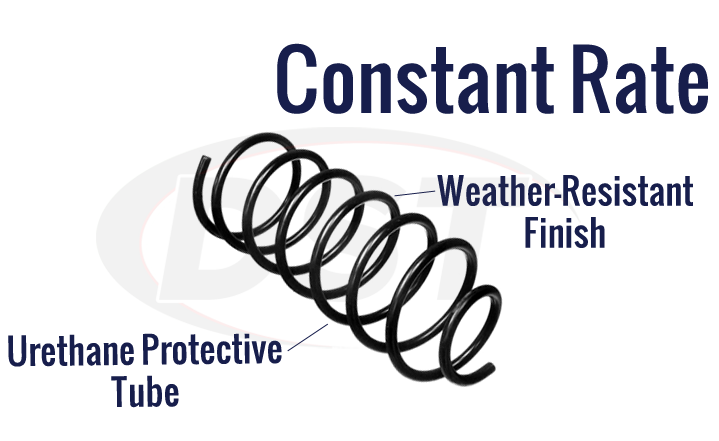 Having the same spring rate allows for an easier install and a more accurate restoration for your vehicle's ride. Coil Springs have three types of ends: Square, Tangential and Pigtail. It is important that you select a coil spring that matches BOTH your end types, otherwise the coil spring won't fit. 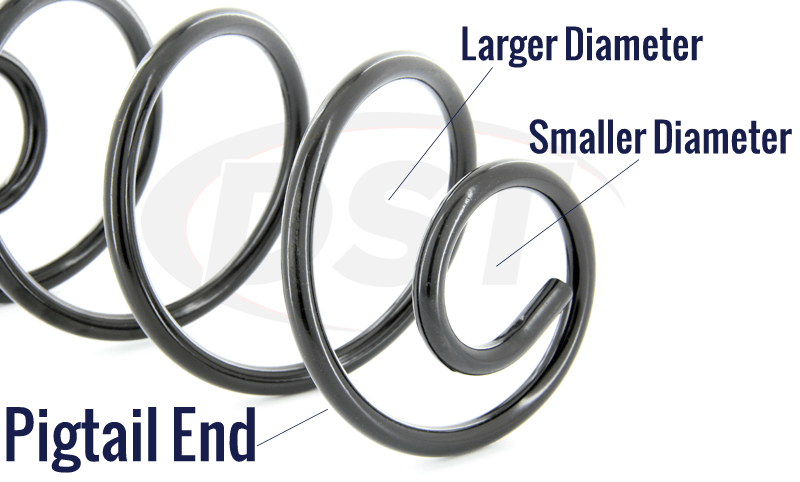 Your OE coil spring could have the same type ends, or a combination of both. With a Squared end, the final coil is bent back to touch the coil before it. The easiest way to know if you have a squared end is to stand the coil spring straight up. A squared end will let the spring sit flat on the ground and stay standing. A Tangential end looks like it would just keep on going forever if the spring continued. The last coil is not bent back and it is not the pigtail (see below). Instead, the tangential coil spring looks as though a normal coil was just cut, otherwise, it would have kept winding on forever. If you tried to stand it up straight, it would fall. The Pigtail is probably the easiest to identify.  Its defining characteristic is the pig tail shape at the end. The final coil is squared off, but is a much smaller diameter than the rest of the spring. Moog offers two types of springs for a universal fitment: Constant Rate and Variable Rate. 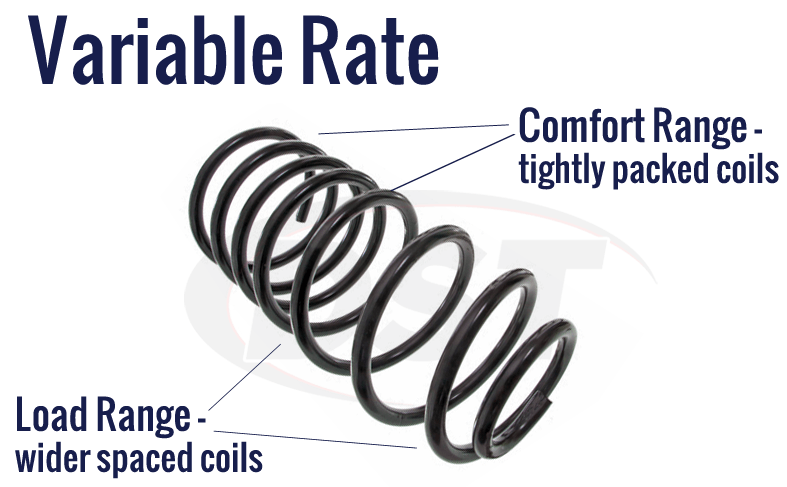 Moog Constant Rate coil springs return your vehicle to the original specifications. The rate at which the spring compresses and rebounds remains constant regardless of the amount of load on the spring. These coil springs are heat treated, have a weather resistant finish and use a urethane protective tube. Moog Variable Rate coil springs can be used as an original replacement or an upgrade to carry heavier loads. 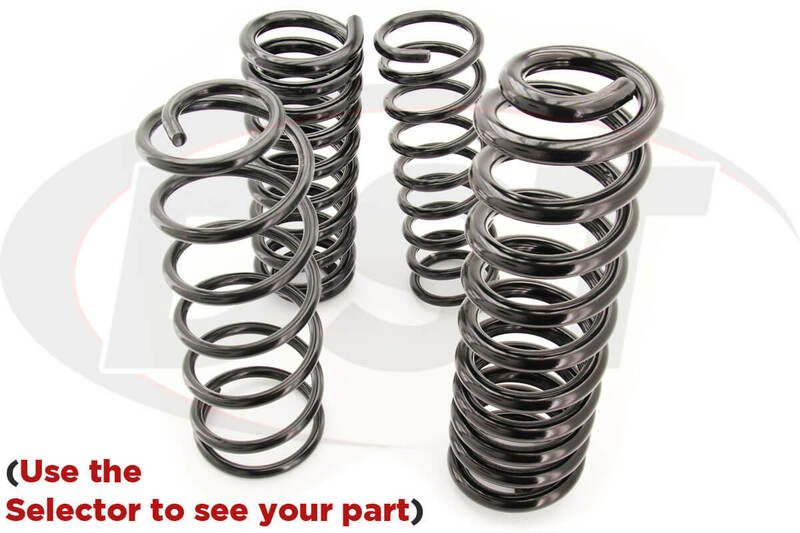 The resistance changes as the spring compresses, becoming progressively stiffer as the load on the springs increase. The springs include a "comfort range" with tightly spaced coils to give a smooth ride, and include a "load range" with widely spaced coils to minimize deflection and maintain chassis height when the vehicle load increases.